(G)REENWICH (V)ILLAGE (D)AILY (P)HOTO: Why Mars Bar ? interesting textures; but i'm not sure I'd trust that A.T.M. As opposed to Marr's Bar. Doesn't realy enhance NY's rep as the center of swank sophistication, does it? This was one of the last great anyman Everyman bars in the Village. It's over, it's all frat bars, stylish bars, bars for fake drinks, for tourists. New York City is NYC in name only. Another nail in the coffin of was once New York City. I'm starting to like this place more and more. What a shame! I can relate to outsiders and tourist taking away a special place and replacing it with their twisted version. This reminds me of an old song by Johnny Thunders "You can't put your arms around a memory"
New York City is gone and it's not comming back. Comme quoi, la laideur poussée à l'outrance peut finir par être très drôle. Maintenant, je ne verrais pas toutes les boutiques et bars de cette ville, ainsi décorées. Ce serait l'overdose ! Je ne sais pas quels ont été tes sentiments en découvrant ce monument ? Home of the Caramel Appletini. I'm with you on this one Ken. Once the heart and soul are ripped out the only thing left is the carcass. And the memories of what once was. It's a touching tribute, Ken. The homogenisation is not unique, though. Same thing has happened in my hometown of London where over the years every quirky independent cinema is now owned by Warner Brothers and people who used to order a white coffee with one sugar from the locally owned cafe now order a tall hazelnut latte from the local Starbucks. You could go to a high street 500 miles away and see the same shops serving the same things. The Mars Bar looks pretty inviting to me - and how about that name? Genius. I am very much interested in adding http://greenwichvillagenydailyphoto.blogspot.com/ in my blog http://the-american-history.blogspot.com/. A highly interesting and at the same time moving post. As a foreigner my impression was also based on "Annie Hall", not to mention "Manhattan" (my favourite film ever). It is a pity to see such things go, though it happens all over the world. But that is no excuse. I'll treasure the few photos I've got from the "real" New York" and try to document more of my own home town. I know New York through movies, never spent any time there. The movie that comes to mind with your post is "Batteries Not Included." It's and old one. I don't want every city on earth to look the same, and have all the same shops and restaurants. where's the character in that? Sad. KM, thank you so much for continuing your heartfelt chronicle, providing excellent photos that are artistic and REAL, and especially for giving us such direct summary of the demise of a cherished bastion of American diversity and genius. True, though, it is happening to every city. What was 'cara's' word? HOMOGENISATION. Milquetoast. Early 90's -- I was so inebriated I was thrown OUT of Mars Bar. That is some feat, being too drunk for Mars Bar. I am horrified by the entire change in the East Village since the early 90s. It's unrecognizable execpt for a few old stalwarts. Thanks for documenting these priceless pieces of culture before they vanish. I am completely with you, Ken. 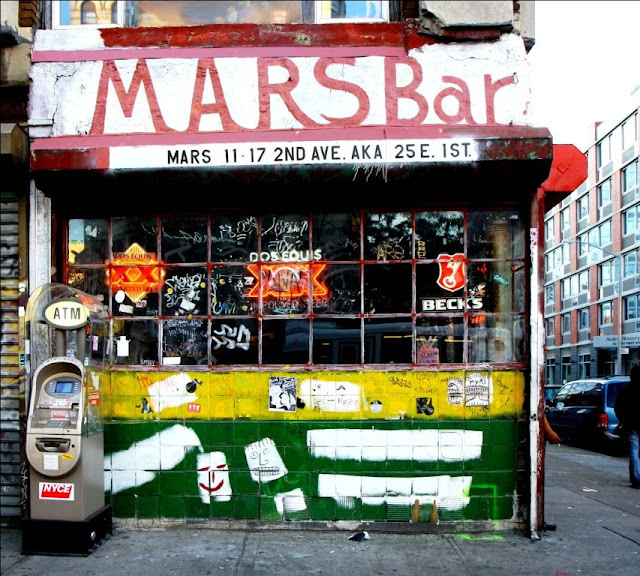 Everyone, everyone, who has lived here more than just a little while, knows the Mars Bar. Everyone. Mark used to drink there with his buddies until very late, then stand outside below the weathervane (when there was one). The direction the weathervane was pointing would lead them to their next destination. It is really sad. There are many charmless places in nyc now, places without personality, without quirkiness. New York used to be gritty and authentic, unafraid to be itself. This why we love ya KM. We depend on you to show us the way! I cherish these old dives. Save me from another soulless, corporate space. As yuppie suburbanites move into cities, they bring along with them the expectation that their newfound urban neighborhood have the same sanitized feel of the residential tract neighborhood they left. It can be seen in every gentrified section of cities all over the United States. Brooklyn is seeing the same intense gentrification that Manhattan has undergone. GVD has been quiet for a longer-than-usual time. Hope this means you're enjoying a Christmas break. Passionate and eloquent, Ken. I'd be glad to see your prose here more frequently. I wonder how much (your) Detroit is an example of what happens to the old if it's NOT preserved. Once a place becomes the proverbial war zone or moonscape, it's probably too late to preserve. Detroit has some GREAT looking old buildings remaining, but I worry about their future. Who took all this amazing pictures? I stopped in on Christmas and was surprised to see so many people I know. It's probably the one place that still feels like a neighborhood hub to me. There's just no other place like it.